Villa Borghese is a large English landscape garden (80 hectares) in Rome situated near the Spanish Steps. Inside the park are paths, villas, statues, lakes, museums and Galleria Borghese. 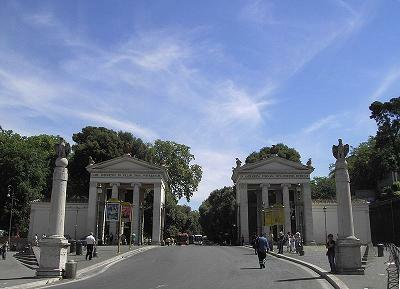 Other facilities/services inside Villa Borghese are a zoo, puppet theatre, cinema, bicycle hire and a restaurant. The garden is allways open and has many entrances. If you don’t want to walk all the way; a small electric bus is riding through the garden. 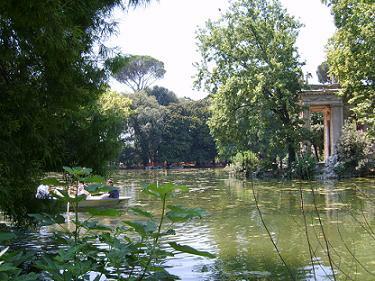 Most wellknown attraction in the garden is Galleria Borghese with paintings and works from Titan, Caravaggio, Bernini, Caravaggio, Pinturicchio, Veronese and Rubens. The museum is closed at monday. Full ticket price is €11. EU citizens aged 18-25 and EU teachers pay €6.50 and children under 18 pay €2. Every first Sunday of the month, the admission to the gallery is free. Metro station Spagna is on top of the Spanish Steps. The main entrance of the park ‘Piazzale Flaminio’ is close by this metro station.